"A classic steakhouse-style spinach salad with the absolute best warm bacon-mustard dressing I've ever had! Looks and tastes like a lot of work, but can be prepared in no time! This salad can easily be converted to a main dish salad by adding strips of grilled chicken breast." 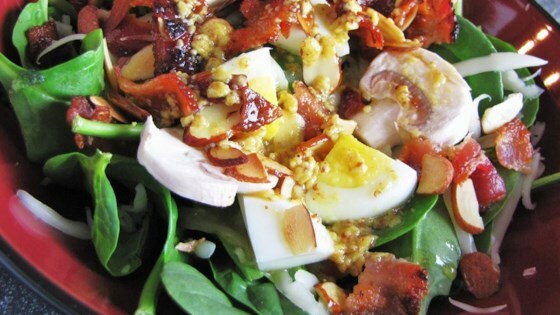 Steakhouse-style salad loaded with flavor and bacon! BEST SPINACH SALAD I HAVE EVER TASTED! The dressing on this salad is so good. I poured some extra on some cooked potatoes the next day for an instant potato salad. Great recipe! The most unbelievable salad!!! I'm hooked!!!! My kids even love it!! !